Researchers at NASA Ames Research Center in Mountain View, CA have teamed up with researchers at University of California, Berkeley to design and engineer what might be the next generation of space-exploring robots. These robots are wildly different than traditional rovers, which are super expensive, really heavy and hard to land. The new robots are based on a type of structure known as a “tensegrity” structure. The rigid parts of the robot are held together with cables instead of being directly connected by bolts or screws. This allows these robots to be lighter, cheaper and more robust than traditional rovers. The eventual idea is to be able to equip these robots with instruments (like cameras and lasers), pack a bunch of them into a space shuttle, and then drop them from orbit so they can roam and explore a planet or moon. 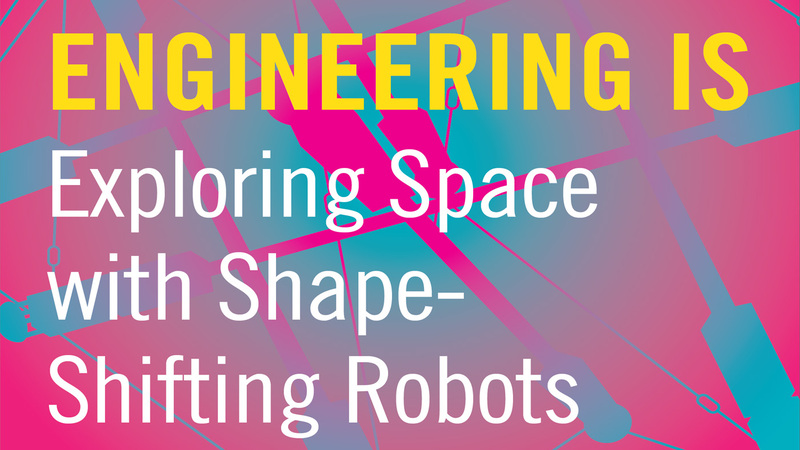 Aligned with the Next Generation Science Standards, the new media-rich e-book from QUEST, Engineering Is Exploring Space with Shape-Shifting Robots details the process for how researchers and engineers are designing these new space-exploring robots. The e-book contains a video that shows the engineering design process for the tensegrity robots as well as a Science Spotlight video that describes how students can make their own tensegrity models using just straws and rubber bands. A Career Spotlight video about a robotics engineer at NASA Ames rounds out the media collection in this e-book. Engineering Is Exploring Space with Shape-Shifting Robots is the fifth e-book in our “Engineering Is…” series and is available to view on your computer, tablet and smartphone, for free. You can find links to all of KQED’s e-books at kqed.org/ebooks.